Poker Copilot 4 has a new set of player icons. We’ve taken care to make sure they can be easily distinguished at small size, even if you eyesight isn’t great, or if you have colour blindness. There are also high-definition versions for people with Retina displays, although that might not be working yet. Try it out now on the early access version of Poker Copilot 4. Poker Copilot now has a sticky support thread in Two Plus Two Poker Forums. It mostly exists for marketing reasons. It is still preferable that you send support requests to support@pokercopilot.com or use our own Poker Copilot discussion forum. Thanks to loyal Poker Copilot user Maarten, Poker Copilot 4 is now completely translated into Dutch. Currently the Dutch, French, and Russian translations are complete. If you’d like to volunteer finish the translation into your language you can help here. If you’ve been trying out the early access builds of Poker Copilot 4, I recommend you download the latest build and try out the new-look hand replayer. 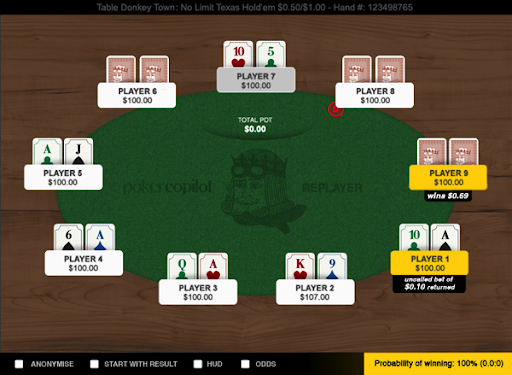 At the moment some of the positions of the cards, player panels, and bet info are askew. But 9-max tables should have everything in the correct place. The Hand Replayer is getting a fresh look in the forthcoming Poker Copilot 4. Here’s a preview of what you’ll see. Full Tilt Poker released an update today. It made some subtle but critical changes to the hand history format. I’ve fixed PCP Dallas to handle this. You can update here if you are trying out PCP Dallas. I hope to have the fix in Poker Copilot 3 within the next hour. You’ll know when it is done by restarting Poker Copilot 3 and receiving the “There’s an update” message. PCP 4 Dallas Translations: Please Help! I check every day to see if there are updates to the translations, and if so, I add them to the latest PCP Dallas EAP build. If you are fluent in any of these languages, it is easy to join in and translate even one piece of text. 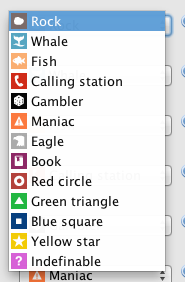 So why don’t you have a go at the Poker Copilot translation site. The Cessna plane that got me to the rainforest. Kaieteur Falls, the most spectacular waterfall that most of us have never heard of. If you’ve been trying the early access builds of Poker Copilot 4, then here’s some news: As of now, Poker Copilot 4 no longer has a separate database and settings from Poker Copilot 3. When you next download and try Poker Copilot 4, your existing Poker Copilot 3 database will be detected and upgraded to Poker Copilot 4. While your database is updating, you can’t use Poker Copilot 4. After the database update, Poker Copilot will spend some time recalculating your statistics. While this is happening, you can use Poker Copilot 4, but note that not all hands will show in your statistics until the recalculation is complete. If you play on Winamax, you’ll need to set your preferred Winamax set again in Poker Copilot 4. All other settings are copied from Poker Copilot 3 to Poker Copilot 4. The last couple of weeks has been a time to let Poker Copilot 4 “settle”, as the last major bugs get flushed out. So I’ve used that time to see parts of the Caribbean. I’m writing from the departure lounge at Barbados Airport, waiting for a flight to Guyana. Ricki Lake is playing on the departure lounge television. Loudly. I don’t like this show. But I do like running a one-person software company, where I can work and travel.